… a radiation characteristic … as if the resurrection itself was a natural event…. MUST READ: It isn’t easy with a Google translation. 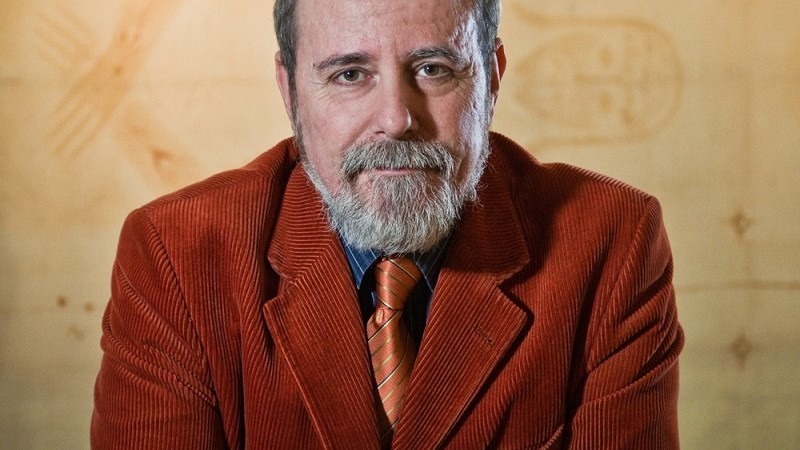 Organize a workshop around the Shroud: Interview with Bruno Barberis, President of the International Center of Sindonology Turin, however, is important. [The Question] The debate around the Shroud at that point has arrived and what is your opinion on the debate in recent decades? [Barberis’ Answer] In recent years there has been a lively debate considerably around the Shroud, perhaps as never before in the past, facilitated, without a doubt, an exceptional sounding board provided by modern means of communication. This debate was triggered mainly (but not only) by the now famous radiocarbon dating of the Shroud cloth made in 1988, the result of which (medieval dating of the Shroud) sparked a confrontation not only between scientists and scholars, but also in public opinion. The scientific debate was to take place, as is right and logical, exclusively within those research groups who have decided to grapple with the complex and thorny issue of evaluating the date of the Shroud cloth, with the opportunity to make known experimental results and related theoretical considerations at meetings or scientific congresses. In fact it did not happen, because the debate became incorporated arguments often anything but scientific. Also the media have certainly facilitated the work, as they are often spoken extensively on news of minor and have been silent instead those series, looking almost exclusively of the sensational news. In fact, below that there is another question of far greater thickness and oldest: the controversy between the two opposites ‘fundamentalisms Shroud’, the advocate of absolute certainty the identity of the Shroud and burial cloth of Jesus, and what he believes that the two objects lacking any correlation. It is obvious that everyone is free to propose and defend their thesis, but it is also equally natural that such a defense must respect the logical criteria of modern science. There has however a number of statements and debates in which often start from absolutely arbitrary assumptions and preconceived, using arguments that go against the most elementary rules of logic and therefore leads to conclusions absolutely unprovable. The literature in this area is vast, ranging from the statement that the Shroud is painted a self-portrait of Leonardo, that it is the work of a medieval forger who used techniques not known to us, that which makes the Shroud ‘ scientific proof of the resurrection ‘, or the result of a radiation characteristic of the resurrection, as if the resurrection itself was a natural event, repeatable laboratory and therefore reviewable by scientific methods. And the list could go on much longer. Force the hand of the scientific evidence, or neglect them completely and start from assumptions absolutely baseless, equivalent to damage and discredit the meaning and message of the Shroud that make a unique object in the world. The scholar serious and correct detests the Crusades or against the authenticity of the Shroud image, made just to convince more people of their convictions, without wearing a shred of evidence, or by arguing that struggle with most basic rationality. Starting from the assumption that ‘the shroud is the burial cloth of Christ’ and try to prove it at all costs without bothering to give reasons and objective series or to assume that ‘the Shroud is the work of a medieval forger’ and do the same tantamount not only to perform a scientifically incorrect, but also to tease all those who, eager to learn more, to take good similar conclusions. The only serious and honest behavior is that of someone who, wanting only to know the truth, stands humbly to his research, without claiming to want to demonstrate any preconceived thesis, and, indeed, rejecting everything that can not be seriously and scientifically proven . On this subject, it is expressed very clearly Saint John Paul II in his speech in front of the Shroud May 24, 1998: "The Church urges [scientists] to face the Shroud be studied without pre-established positions that take for granted that these results do not they are; invites them to act with interior freedom and attentive respect for both scientific methodology and the sensibilities of believers. " On that occasion the Pope, very effectively, called the Shroud ‘a challenge to our intelligence’. The discussion on the Shroud often degenerates because the Shroud is not a neutral object, it involves both the reflection of historical-scientific, is that kind of religious creed. If it were a sheet in which you think has been wrapped any other historical figure, all these discussions are not met. Therefore only keeping separate the scientific approach and the religious (both basic and complementary) you can think of to deal with a serious study on the Shroud and honest. [The Question] Professor Luigi Campanella has developed methods that could perhaps give a measure of the pollution of the Shroud. Because these methods are not used because they do not realize other analyzes on the Shroud? -because the Shroud remains inaccessible to scientists? [Barberis’ Answer] . . . It is not true that the Shroud is inaccessible to scientists. Personally I am absolutely conducive to the holding of new direct studies on the Shroud provided, however, that it is non-destructive testing: we can not treat the Shroud as a lab rat, especially considering that it is a unique object. Current technology allows you to make meaningful analysis of fibers with a thickness of a few micrometers which therefore require withdrawals nondestructive. A new campaign of direct studies on the cloth should aim to collect more data to form a complete map of the physical, chemical and biological properties of the entire Shroud, to be made available to scholars so that they can work and confront on accurate, reliable. To do this it would be necessary to organize a program of analysis using modern and sophisticated equipment: a real laboratory for the Shroud. The costs of such a complex operation would certainly very consistent. Only after an analysis and a detailed study of the Shroud could possibly make sense to program a new dating of the cloth. Barberis’ reply to this question is self-contradictory and arguably hypocrite. on linen samples already taken from the Shroud in the past. The mantra again, updated. We need data ,more tests and what happens next? Advanced microscopy permitted to observe interesting features. >Working with ancient DNA is very challenging, both in terms of finding sufficient material to work with after decomposition has occurred, and in terms of eliminating modern human contamination. Distinguishing between modern human and ancient genetic material is particularly difficult when the ancient DNA comes from close relatives of modern humans. The genetic issue is very interesting …. Do you know Svante Pääbo ? Pääbo (born 20 April 1955) is a Swedish biologist specializing in evolutionary genetics. One of the founders of paleogenetics, he has worked extensively on the Neanderthal genome. Do you know direct imaging of DNA sequence by atomic force microscopy ? Ancient DNA is a controversial argument. But the Shroud passed through many hands, and then there are also genetic fingerprints do not belong to Jesus. We can presume that all of Jesus’ genetic material would have come from his mother Mary and then we can try to test this hypothesis. We can presume that all of Jesus’ genetic material would have come from his mother Mary and then we can think to test this hypothesis using the samples that we can obtain. But I think that is very difficult to obtain something from what should be at disposal if we are not true expert in the specific field with an adequate Lab and a scientific team supporting the difficult enterprise. I don’t believe in hasty works of laboratory on genetic materials coming from the Ancient Shroud. Also the findings and ideas by Svante Paabo are controversial since there is not a complete consensus (if I a m right in my knowledges on that biogenetic argument)… This question is also connected with the problem of “Neanderthal mankind” (= Homo Sapiens neandertalensis) . >Excavations of a complex of caves in the Sierra de Atapuerca in northern Spain have unearthed hominin fossils that range in age from the early Pleistocene to the Holocene. One of these sites, the ‘Sima de los Huesos’ (‘pit of bones’), has yielded the world’s largest assemblage of Middle Pleistocene hominin fossils, consisting of at least 28 individuals dated to over 300,000 years ago. The skeletal remains share a number of morphological features with fossils classified as Homo heidelbergensis and also display distinct Neanderthal-derived traits. Here we determine an almost complete mitochondrial genome sequence of a hominin from Sima de los Huesos and show that it is closely related to the lineage leading to mitochondrial genomes of Denisovans, an eastern Eurasian sister group to Neanderthals. Our results pave the way for DNA research on hominins from the Middle Pleistocene. >Denisovans or Denisova hominins are an extinct species of human in the genus Homo. In March 2010, scientists announced the discovery of a finger bone fragment of a juvenile female who lived about 41,000 years ago, found in the remote Denisova Cave in the Altai Mountains in Siberia, a cave which has also been inhabited by Neanderthals and modern humans. Two teeth and a toe bone belonging to different members of the same population have since been reported. >Analysis of the mitochondrial DNA (mtDNA) of the finger bone showed it to be genetically distinct from the mtDNAs of Neanderthals and modern humans. >Subsequent study of the nuclear genome from this specimen suggests that this group shares a common origin with Neanderthals, that they ranged from Siberia to Southeast Asia, and that they lived among and interbred with the ancestors of some present-day modern humans, with about 3% to 5% of the DNA of Melanesians and Aboriginal Australians deriving from Denisovans. Perhaps the account of Eve is an interesting and important segment of our genetic history. The Bible says that God put Adam into a deep sleep, took one of Adam’s ribs, and made a woman (Genesis 2:21-22). Adam named her Eve and proclaimed that she was “bone of my bones and flesh of my flesh” (Genesis 2:23-24). … So, how does modern science line up with this account? Were Adam and Eve identical twins? We can fantasize about original sin as long as we want, Abel and Cain, etc., etc. In the past I read things like that. Those are particular issues, what seems to be interesting is what you might get from the DNA sequence of the “Man of the Shroud”. Here I stop my long speech (sorry!) and then I stay on hold. “The Neandertal genome and ancient DNA authenticity”, EMBO J. 28: 2494 (2009). >The Neanderthal genome project is a collaboration of scientists to sequence the Neanderthal genome. >It is coordinated by the Max Planck Institute for Evolutionary Anthropology in Germany and 454 Life Sciences, a biotechnology company based in Branford, Connecticut in the United States. Founded in July 2006, the project published their results in the May 2010 journal Science detailing an initial draft of the Neanderthal genome based on the analysis of four billion base pairs of Neanderthal DNA. The study determined that some mixture of genes occurred between Neanderthals and anatomically modern humans and presented evidence that elements of their genome remain in that of modern humans. >In December 2013, scientists reported, for the first time, a high coverage genome of a Neanderthal. The genome was extracted from the toe bone of a Neanderthal from over 50,000 years ago, found in a Siberian cave. ‘Destructive tests’, including C14 tests, can be done without any additional destruction of the Shroud, because there are still a number of unused samples out there. Especially the smaller piece that has been given to the Tucson lab: this sample should be used to test whether the age gradient observed in the 1988 measurements (Oxford old, Zürich in between, Tucson young) is real or not. This gradient is an objective, unusual and very disturbing aspect of the 1988 C14 dating, and the publication in Nature looks as if the phenomenon has been swept under the rug by the authors on purpose (I say: ‘looks as if’; this is not an accusation). In order to set the record straight, the authors should use the samples that they still possess to clear out this point. They should present a research plan, including a description of the samples that still exist, and a scheme of the statistical tests to be performed for checking the existence vs. non-existence of the gradient. Why is this not done? Where are these residual samples right now? Why the silence? The sample is not representative and I would see little point in testing it. Until truly representative samples are taken complying with proper protocols, there is no point in testing pieces which might well be merely patches. In 1998 I wanted to draw attention to the new advanced microscopy techniques (see also their use in explorations performed by space probes …). >One major benefit of AFM is that destructive agents like fluorescent proteins need not be applied. A consequence, however, is that researchers may mistake the wrong molecule for their sample because both it and contaminating particles that get in the way are too small to see. I’m not really an expert in molecular biology and genetics, however, I see that no one is able to achieve something concrete in this difficult field. Perhaps we still have to wait. The speeches of Kelly Kearse are very interesting, but at the moment I do not see appear new analyzes on samples from the Shroud … and this is what we all very interested. the humanity of the past (including relations with Neanderthals and Denisovians) and genetic heritage that has come down to modern man. and then we face the problems of accurate analysis on ancient DNA. This is the key point, see also: the degradation of the genetic material and the degree of probability of correctly interpreting the data obtained. inside many ancient human fossils from previous handling without specific precautions. and were able to reduce high-contamination fractions to negligible levels. to five of six previously published complete Neandertal mitochondrial genomes. > In this representation of an atomic force microscopy experiment, a single polyprotein (green) is tethered between a gold-coated cover slide (yellow) and a cantilever tip (blue). The protein consists of identical immunoglobulin domains that unfold independently when a stretching force is applied. Unfolding one of the middle domains has exposed its cysteine residues, which can then form complexes with oxidase enzymes (white). Researchers in the Fernandez lab use the technique to study the process of protein folding. … These are special tests. Do you remember the interesting questions of structural mechanics? Do you know protein engineering ? Do You know anyone who is able/accustomed to using the AFM techniques for analyses? Yesterday I was in a hurry. (but we know that Ray Rogers denied that irradiation). the effect of radiation on materials. 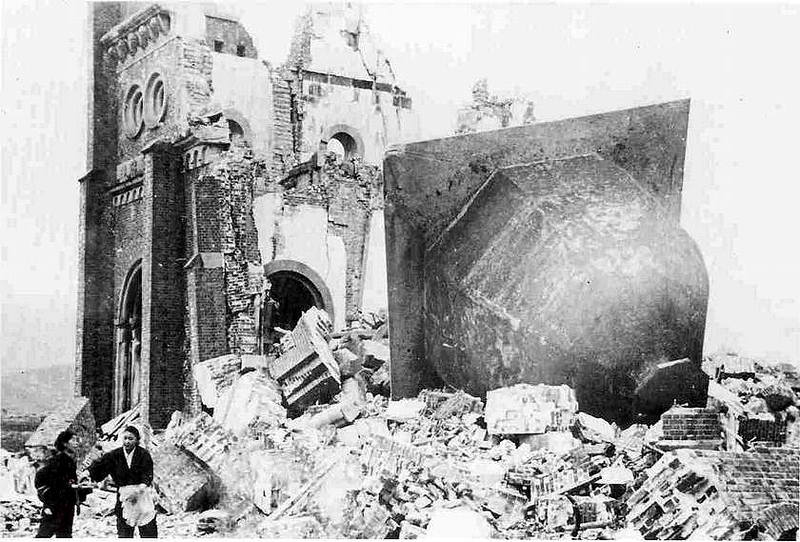 Have you seen the effect of nuclear bomb on a cathedral in Japan (Nagasaki)? the use of nuclear bombs. government of Ukraine or new political and economic characters who want to revive “the glorious czarist past” want to use nuclear weapons to solve their difficult geopolitic-economic problems . But sometimes the History gets out of hand its protagonists. See what happened after the famous attack in Sarajevo in 1914 (= WWI). (…when we are not high level scientists or true experts in the matter). Here I return on my previous message. on degraded DNA coming from the Shroud. the cantilever can detect small change in force. >Good data depends on the quality of your experimental setup. with the sample exposed to air. certain that this can be useful to observe. Shroud of Turin,” Applied Optics 19, 1930-1936 (1980). But the Lab works on ancient DNA are difficult.